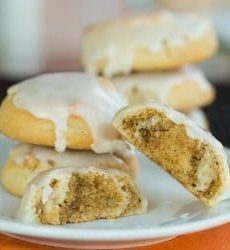 My grandma's famous cookies - miniature nut roll cookies covered in a simple icing. 1. Preheat the oven to 350°. Line two cookie sheets with parchment paper. Make the Dough: In a medium bowl, whisk together the flour, baking powder and salt. Using an electric mixer on medium speed, cream together the sugar and shortening. Add the egg and vanilla and combine well. Add in the remaining ingredients, alternating between the flour mixture and milk, starting and ending with the flour mixture and making sure all of the ingredients are well incorporated. (The dough will be soft.) Divide the dough into four even pieces, wrap each in plastic wrap, and refrigerate for at least 1 hour. Make the Filling: In a large bowl, stir together the chopped nuts and the sugar. Add the melted butter and stir until evenly moistened. Add the egg whites and mix well until completely combined. Assemble the Cookies: On a well-floured surface, roll out a piece of dough into a rectangle measuring about 6 inches by 18 inches. Using an offset spatula, spread one-quarter of the nut filling onto the dough, leaving a small border around the perimeter of the dough. Roll up as you would a jelly roll, with the short ends to the left and right of you, and seal the ends. Cut the roll into 1-inch pieces and place on the prepared baking sheet cut-side-up. Repeat with the remaining pieces of dough and filling (you should be able to fit all of the cookies on two baking sheets.) Bake until the cookies are a light golden brown, about 30 minutes. Transfer the cookies to a wire rack and cool completely. Ice the Cookies: Once the cookies are cooled, whisk together the powdered sugar, vanilla and milk in a small bowl. Dip the tops of the cookies into the icing and let any excess drip off. Allow the icing to set completely before storing. The cookies can be stored in an airtight container at room temperature for up to 2 weeks. These cookies also freeze incredibly well.